Instructor Tava Naiyin of Norwalk runs through the moves of Turkish dancing at The Westport Library's Dance Around the World event held at the Westport-Weston YMCA, Sunday, Jan. 27, 2019, in Westport, Conn.
WESTPORT — Not only does Westport read, but it dances as well. 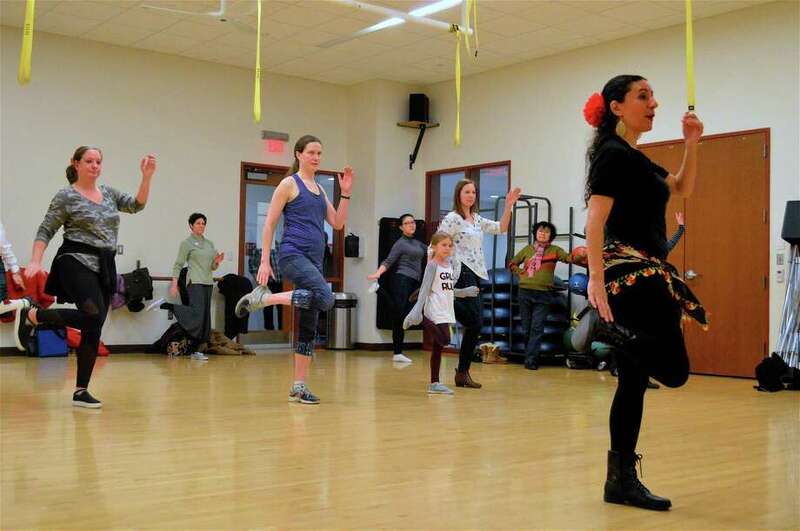 As part of the WestportREADS program, which this year centers on the 2017 novel “Exit West” by Mohsin Hamid, a Dance Around the World event was held at the Westport/Weston YMCA on Sunday afternoon. “Our interest in dance is in showing how different cultures celebrate around the world,” said Jennifer Keller, program coordinator, with this particular book involving many locations around the globe. Three different teachers gave instruction in Flamenco, Turkish and Scottish dance, respectively, with attendees enjoying some impromptu performances by the experts as well. “During WestportREADS we always have community partners,” including the Y, Keller said, noting that with the library undergoing renovations it’s more important than ever this year.